Previous Let’s have tea when we get home! Thank you very much! I recently added some new colors to my palette, and I am conducting a little experiment where I’m a) reducing the number of colors I mix together b) stick to just one brand c) stop painting before I think it’s done. Very effective composition. I like that you used a vertical rather than horizontal format. It gives the beautifully handled sky breathing room. The diagonals in the sky are mirrored in the slope of the hill below and help to organize the space very well. Thank you, Jeff, for your kind words. 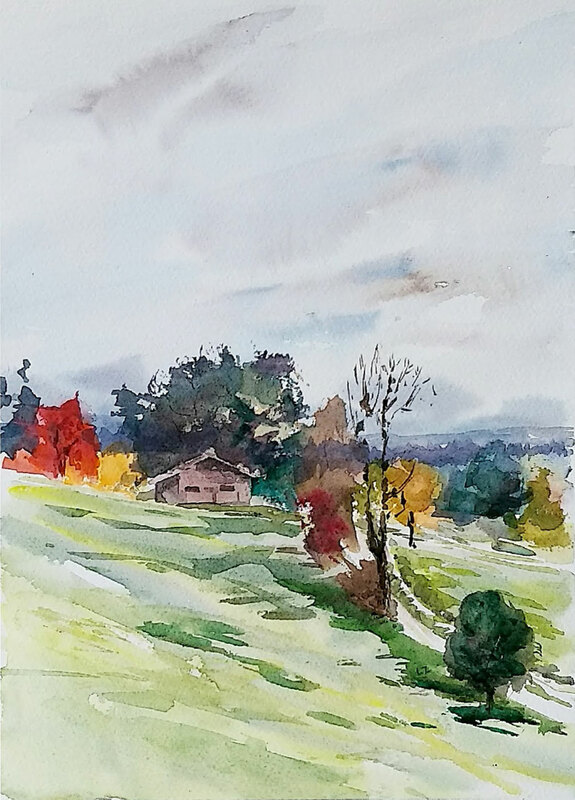 My aim was to create an equal balance between sky, hut and trees, and the field below. I’m glad I didn’t succumb to the temptation of adding another layer to the sky. I think this is really great and conveys a real sense of joy in its painting. Great advice too that I know I need to try to heed more often than I manage!